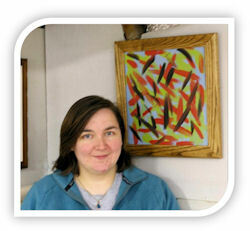 Gillian Sloan & Gwyn Moses have been stalwarts of DIYframing since the framing bug took hold in January 2008. It started with Gwyn booking a weekend’s training as a birthday present, in Beaconsfield, with Alex. Not only did Gill enjoy this new venture, she also turned out to be pretty good at it. Since then she has completed the 3 additional, practical modules of the Business Week: 3D(box) Framing; Conservation Framing; Framing Fabrics. The interest in taking her framing skills even further was intensified after taking part in the first set of Master Classes that DIYframing ran with David Wilkie. Picture framing started out as a natural progression to Gill’s and Gwyn’s shared hobby (well, passion), which is photography: in particular wildlife and landscape photography. In fact they never travel without their cameras and lenses. Even when visiting DIYframing in Beaconsfield, they always have a weather eye out for the red kites, parakeets and deer that constantly make an appearance. As usually follows in these articles, what started out as a means to presenting and exhibiting their own work, quickly “morphed” when friends and family brought projects for Gill frame. Now that Gill & Gwyn have moved to Invernesshire, the hobby has become Gillian Sloan Framing. Gill had been a self employed IT trainer, travelling all around the UK. Nowadays the daily commute to her framing workshop, an outbuilding in the garden, is infinitely preferable. The core of her new set up is the picture framing business, although the photography is never far away: another strand of the business is pet photography. Having your work close at hand and under your own control means that you can set your own work hours and determine how busy you are. 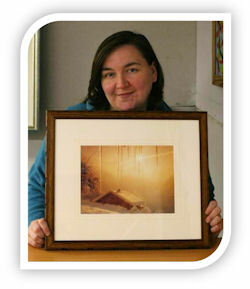 Following on from the training with DIYframing, Gill had become aware of the Fine Art Trade Guild and the Guild Commended Framers Award. She researched it further at trade shows where she was able to talk to staff from the FATG. The notion of sitting the GCF award not only made good business sense, there is also an amount of personal pride in having “GCF” after your name. Ahead of even booking the exams, Gill bought the GCF study guide: in fact this is essential reading whether you intend to sit the exams or not. 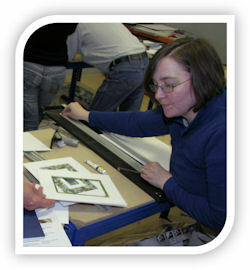 It provides an ideal reference source for methods and materials used in picture framing: it has always been one of the foundations on which the DIYframing training programme has been based. Other ways of preparing were to do a great deal of research about product , making sure the correct one was used for each element of the three framed pieces being examined. Also, looking up framers forums on the Internet helps with keeping an eye on current issues and solutions. To really ensure that she was properly prepared, Gill also booked in on a “Guild Commended Framer preparation day” with Lyn Hall GCF Adv. In simple terms the GCF exam is a test of basic framing skills. There are 3 elements to it. Ahead of the practical exam there is a written test: the FATG give excellent guidance on the type and content of questions posed. Also prior to the examination day, you bring in 3 framed pieces, each one prepared to specific requirements set by the FATG for the exam. These will be discussed with the examiner, who looks at the quality and accuracy of your work, product choice and the aesthetic appeal of each piece. Finally there is a practical exam where you will be asked to carry out tasks, with the examiner in attendance. For more guidance click GCF Award: this will open an area of the FATG website in a new window. Good preparation on Gill’s part meant that the written element was not as scary as she had anticipated. Stretching the canvas was difficult for her, but mainly because she had injured her hand. And, although nerves took hold making drawing coloured lines on the mount a little fraught, she was fine after a couple of “practice” efforts. All in all there were no other major problems; unless you count getting lost on the way to the examiner’s workshop. Of course they all pale into insignificance when compared to the high of receiving the email to say you’ve passed. Having passed so recently, Gill hasn’t yet received her certificate so no cheesy photos to mark the occasion ... yet! Think about the examples you need to take with you; you will probably be asked to explain every choice you made, even down to the image choice.